The ACAN action followed a decision it made in 2001 to have Ice Stream B renamed Whillans Ice Stream, in honor of Ian M. Whillans, who died on 9 May 2001 at the height of his distinguished glaciological career. Ian was among the first to study these West Antarctic ice streams and he made major contributions to understanding their dynamics thereafter, most notably on Whillans Ice Stream. Shortly after radio-echo sounding was introduced in Antarctica, radio-echo flights during the 1969-1970 austral summer identified five ice streams that entered the Ross Ice Shelf from the West Antarctic Ice Sheet. These were named ice streams A through E by the investigators, all from the Scott Polar Research Institute in Cambridge, England (1). Landsat satellite imagery soon disclosed the location of another ice stream north of ice stream E, which was called ice stream F (2). These discoveries closely followed the discovery by John Mercer that the West Antarctic Ice Sheet had been much larger in the past, a conclusion he reached after mapping lateral moraines up to 2000m above the foot of Reedy Glacier (3). 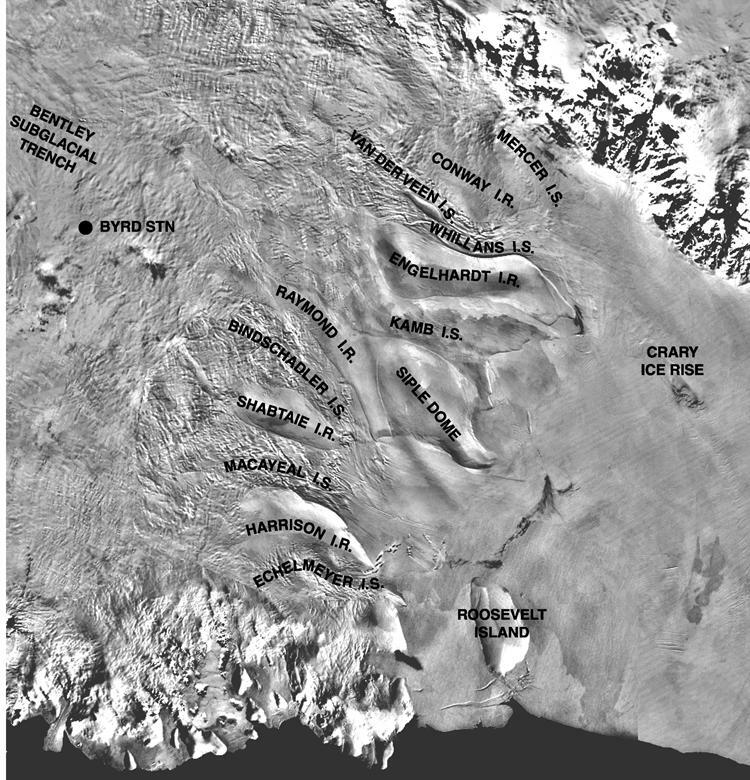 Reedy Glacier is the main East Antarctic tributary of old ice stream A, which mostly drains West Antarctic ice, so the high moraines had to result from thicker West Antarctic ice. Then, in 1972, Ian Whillans re-surveyed the Byrd Station Strain Network, which went from old Byrd Station to the West Antarctic ice divide. Ian found that the ice surface was lowering, with lowering increasing downslope (4). This indicated that the surface lowering reported by Mercer was still going on. The l970s was the decade of the Ross Ice Shelf Project (RISP). Under that umbrella, the University of Wisconsin under the direction of Charles Bentley conducted the Ross Ice Shelf Geophysical and Glaciological Survey (RIGGS). When RISP was complete, much of the RIGGS team extended the same measurements, notably seismic and radar mapping, across the grounding line of the Ross Ice Shelf and onto the West Antarctic Ice Sheet. Sion Shabtaie was a major part of that team. His collaboration with Bentley led to many seminal papers, among which was mapping the surface and thickness of ice streams A through C, and intervening ice ridges AB and BC (5). Their work was done under the umbrella of the Siple Coast Project (SCP) in the 1980s, which became the West Antarctic Ice Sheet Initiative (WAIS) in the l990s, largely under the direction of Robert Bindschadler at the NASA/Goddard Space Flight Center. He chaired the working group that produced the WAIS Science and Implementation Plan for the National Science Foundation (6), and he has chaired the annual WAIS workshops ever since. A critical component of the WAIS Science and Implementation Plan was drilling through some of the West Antarctic ice streams. This was done by Barclay Kamb and Hermann Engelhardt, from the California Institute of Technology, who focused attention on ice streams B and C. Their studies included developing new drilling technology and instrumentation of boreholes (7) and led to a new understanding of the role of subglacial till in the fast motion of ice streams (8). Drilling was also conducted through Siple Dome, which was at the end of ice ridge CD. Charles Raymond correctly interpreted radio-echo stratigraphy of Siple Dome and, perhaps more importantly, developed a theoretical model for heat flow in and migration of shear zones between ice ridges and ice streams (9). Modeling has always been an important WAIS objective. Cornelis van der Veen, often in collaboration with Ian Whillans, has been a major presence in modeling West Antarctic ice streams. Their original approach to the force balance in ice streams is gaining wide acceptance (10). Douglas MacAyeal has also made major contributions to ice-stream modeling, first for stream B, but most significantly for ice stream E. In modeling ice stream E, MacAyeal used control methods to determine the effect of a "sticky spot" on the ice velocity (11). Sticky spots are viewed as exerting a major control on the flow and stability of West Antarctic ice streams. Keith Echelmeyer and Wiliam Harrison have also focused their field and theoretical research on the stability of West Antarctic shear margins between ice streams and ice ridges, with application to the migration of the shear margin of ice stream B (12). They brought to their research on West Antarctic ice streams, a knowledge of fast glacier flow from their collaboration on Jakobshavns Isbrae in Greenland, and on surging Alaskan glaciers. The first comprehensive study of an ice ridge is being conducted by Howard Conway on ice ridge AB. His study is nearing completion and will be our first insight into the long-term stability if ice ridges between West Antarctic ice streams. This brief overview can only give a flavor of the size and scope of research that has been conducted on West Antarctic ice streams and ice ridges by the glaciologists honored by ACAN. They are representative of a very large group of scientists who have worked in this part of West Antarctica, all of whom are deserving of recognition by ACAN. Most of them are young and that recognition will come as WAIS research moves into the Amundsen Sea sector of the West Antarctic Ice Sheet. .1. G.deQ. Robin, S. Evans, D.J. Drewry, C.H. Harrison, and D.L. Petrie, 1970. Radio-Echo Sounding of the Antarctic Ice Sheet, Antarctic Journal of the United States, vol. 5, no. 6, p. 229-232. 2. T. Hughes, 1973. Is the West Antarctic Ice Sheet Disintegrating? Journal of Geophysical Research, vol. 78, no. 33, p.7884-7910. 3. J.H. Mercer, l968. Glacial geology of he Reedy glacier area, Antarctica. Bulletin of the Geological Society of America, vol. 79, p. 471-48. 4. I.M. Whillans, 1973. State of equilibrium of the West Antarctic inland ice sheet. Science, vol. 182, p. 476-479. 5. S. Shabtaie and C.R. Bentley, 1988. Ice-thickness map of the West Antarctic ice streams by radar sounding. Annals of Glaciology, vol. 11, p. 126-136. 6. R.A. Bindschadler (editor), 1995. West Antarctic Ice Sheet Science and Implementation Plan. U.S. National Science Foundation, 75 pages. 7. H. Engelhardt, B. Kamb, and R. Bolsey, 2000. A hot-water ice-coring drill. Journal of Glaciology, vol. 46, no. l53, p. 341-345. 8. B. Kamb, 2001. Basal Zone of the West Antarctic Ice Streams and its Role in Lubrication of Their Rapid Motion. The West Antarctic Ice Sheet: Behavior and Environment, edited by R.B. Alley and R.A. Bindschadler, Washington, DC, American Geophysical Union, Antarctic Reseaerch Series, vol. 77, p. l57-l99. 9. C.F. Raymond, 1996. Shear margins in glaciers and ice sheets. Journal of Glaciology, vol. 42, no. 140, p. 90-102. 10. C.J. van der Veen and I.M. Whillans, 1989. Force budget: I. Theory and numerical methods. Journal of Glaciology, vol. 35, no. 119, p. 53-60. 11. D.R. MacAyeal, 1992. The basal stress distribution of ice stream E, Antarctica, inferred by control methods, Journal of Geophysical Research, vol. 97, series B1, p. 595-603. 12. K.A. Echelmeyer and W.D. Harison, 1999. Ongoing margin migration of Ice Stream B, Antarctica. Journal of Glaciology, vol. 45, no. 150, p. 361-369. Thanks to Terry Hughes for the above write-up.